How many times have you heard a member of the Gardeners’ Question Time audience complain that their lovely acer has gone ‘all crinkly’ and died? Just what is the secret with these plants? 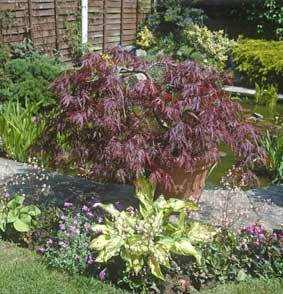 The RHS website describes acers as ‘easy to grow’. And they are when you know how…or rather, when you know where. 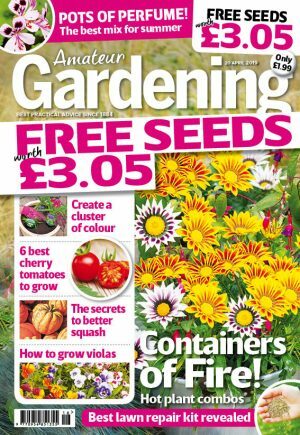 The best advice I was ever given was from nurseryman James Harris of Mallet Court Nursery in Somerset. Acers are happy in all soils, even chalky ones. Heavy clay can be a problem as acers dislike wet feet, so be sure to incorporate some organic matter into the hole at planting time. And don’t overdo the watering. But, he said, if you remember nothing else, the single most important factor is shelter. And the more delicate the leaf, the more shelter it needs. Shelter means a place out of cold easterly and northerly winds and lingering late frosts, as it’s these two problems that cause the damage in spring after the new, delicate foliage has emerged. Putting fleece over leaves if frost is forecast will help, as will providing shelter from overhanging trees, boundaries walls or surrounding buildings. Japanese maples and city/suburban gardens are a match made in heaven, as long as the surrounding landscape has reduced the wind, and not created ruinous wind tunnels or eddies. Here, maples also benefit from the unintended side-effect of protection from unrelenting sunshine. Golden and variegated types are scorched by hot sun and prefer dappled shade, though red and claret varieties are unaffected by sunshine, provided the soil is sufficiently moist. A great spot is in the shelter of a tall tree, planted at the dripline where it won’t have too much competition from existing roots. This might mean digging out the lawn around an existing tree to create a new curved border for your acer. But it’s worth it. Make it a few metres wide and long so it’s big enough to accommodate the mature plant, and to create an opportunity to grow other foliage plants, like ferns and heuchera or an oriental-style border with Japanese lanterns and stone bowls. You could add some evergreen foliage, though the maple’s deciduous outline is attractive in winter. The decision on which variety to go for will be based on three things: i) how big you want your tree to grow – some reach 15ft (4.5m), whilst others stay a around a metre; ii) do you want an upright tree, or a mound shape – for mounds go for a dissectum. Finally it’s down to iii) colour and shape of the leaves. Do you want red, green or yellowish leaves? Or archetypal maple shape or fancy, lacily cut leaves? ‘Senkaki’ – grown for its bright coral stems. Autumn colour ranges from golden-yellow to coral-red. Upright, to 16ft (5m). ‘Bloodgood’ – deep red maple leaves like the Canadian flag. Stunning crimson in autumn. Upright, 16ft (5m). ‘Hana Matoi’ – a new variegated A. palmatum Atropurpureum Dissectum that has acer-philes excited: cream, pink and red in spring; red in autumn. Dome-shaped, to 6-10ft (2-3m). ‘Shindeshojo’ – gives you two bites of the cherry as it tints red in spring and again in autumn. Makes a small, layered shape, to 6ft (2m). ‘Katsura’ – unusual orange-edged leaves from spring to summer. Fiery red, orange and yellow in autumn. Upright, 10-14ft (3-4m). ‘Seiryu’ – lacy green leaves, tinted glorious red in autumn. Very classy in a black container. It’s an upright grower, 6-10ft (2-3m). ‘Deshojo’ – like confused traffic lights, this turns from amber in spring, through green turning red in autumn. Upright, to 6ft (2m). ‘Crimson Queen’ – lacy, wine-coloured leaves, gorgeous in terracotta or white stone. Scarlet in autumn. Dome-shaped, to 10ft (3m).